You worried the fast cars will spook your love making with your sheep? Ladies, feel free to keep on speeding. Your grammar makes me cry. Lets hope it a purpose. Would be bitter enough to say thank god, less stupid people out there, but the kids weren’t driving. A valid point, and well made. If you get caught speeding in Wyoming, expect to pay a hefty ticket, I live in Montana and drove to Denver a few times and I always make sure I use my cruise control. The cops are mean down there. A friend of mine was pulled over just before the Colorado border $180 ticket for going 20 miles over the speed limit, so be warned. In New Zealand if you Speed you can get a fine upwards of $120. If they really don’t like you (think that you are a danger on the roads) the police have the power to automatically take your license and impound your vehicle for a month. 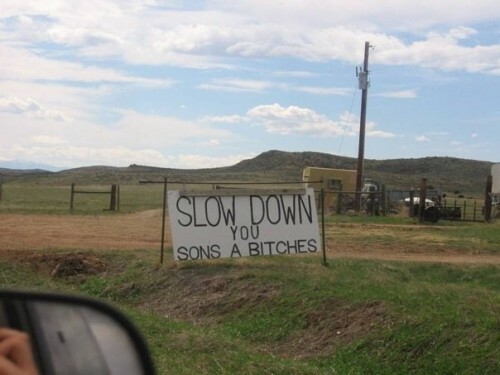 The Government pays for road signs that say “Slow Down”. Maybe if they used swear words people would pay more attention.